Welcome to the daily blog of the American Treasure Tour, where we shout out some of the wonderful, fantastic, and occasionally weird pieces on display right here in Oaks, Pennsylvania as part of our massive collection. Over the years, the blog has highlighted some great musicians, including such luminaries as Air Supply, Deep Purple, Fleetwood Mac, and the Village People. Today, we are going to continue this tradition by calling out a performer beloved by fans across the world: Earth, Wind & Fire. Earth, Wind & Fire were originally called Salty Pepper when Maurice White joined some friends to create jingles for commercials and record their own band. 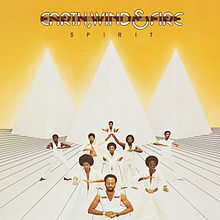 White, a Sagittarius by birth, knew that his astrological sign meant that Fire dominated his core essence, while Earth and Air were his seasonal qualities, so the band became Earth, Wind & Fire. Within a few years, they'd recorded a few albums and drew attention on college campuses. Their first real hit came in 1973, a song called "Evil," and from there they were on the way to greatness. Spirit was their seventh album, released in 1976. It reached the number two spot on the Billboard Pop and R&B Charts and went on to achieve double platinum status, in part thanks to its hit songs "Getaway" and "Saturday Nite." The band has since been Inducted in the Rock & Roll Hall of Fame and the Vocal Group Hall of Fame. They continue to tour to this day, and remain an influence on younger generations of musicians.